When Can a Contract Be Cancelled? That is perhaps one of the most widely believed pieces of nonsensical mistakes California business people can and do make on a daily basis. I am routinely asked for confirmation of that belief and when I inform folks “HECK NO!” they look at me in total shock, followed by the traditional, “Bbbb-But I was told…”. Stop believing what you’re told by unqualified people. 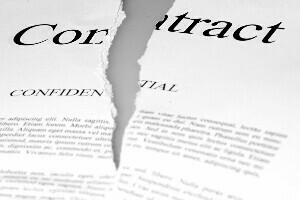 There are, indeed, very certain circumstances where a contract can be rescinded or cancelled. Both of the above circumstances have a three-day threshold. Then there are contracts with immigration consultants (72 hours after signing) – also not a typical B2B situation. There are also contracts to develop inventions – they have a 7-days threshold after signing. In all of the above instances and others where an unconditional right to rescind (as defined by statute) exists, contractors (he who authors the contract) have an obligation to state those limits and rights to rescind in the written terms of the contract. Otherwise – Now pay close attention – Where contracts do NOT state a right to rescind (and are not otherwise controlled by statute), there is NO UNCONDITIONAL RIGHT TO CANCEL A CONTRACT YOU’VE SIGNED! • The consenting party did not receive the consideration (thing of value) for which he had bargained. If you believe, as I do, that your agreements should be written with clarity, state unequivocally the conditions upon which your contract can be cancelled. Clearly state the deadline and the manner in which the contract can be cancelled. If you want to be notified in writing, will an email suffice or will you require cancellation via certified mail? Your rescission term should also specify that any such rescission shall only be at the sole discretion of the contractor. If YOU signed a contract and believe it was a mistake or if someone signs YOUR contract and then tells you it was a mistake, SEEK THE ADVICE OF COUNSEL before you make what could be a costly decision against you. As with all contracts, when you’re trying to create one, please, please and oh yes …PLEASE consult an attorney. The next time someone suggests there is always this mythical unconditional right to cancel any written contract, smile and then quietly suggest to them they need to talk to a good lawyer.